Curtis Slater is an artist that represents from the rampant boulevards of San Antonio, TX. A well renown figure in SA Town's underground rap scene, he is highly remembered for his rapturous flows and energetic performances. Can You Feel Me is his debut solo album and it was released in 2003 on Top Entertainment Inc. The record is excellently produced by Houston's very own, Sean "Blaze" Henderson who is also assisted by Key Jay. The mixing and mastering is provided by the magnificent, Ricé. The engineers do a solid job on the beats and the end result is quite pleasurable. The rhythms presented here are Southern in nature so one can easily expect the use of jazzy horns, conventional hooks and some twangy guitar work which is provided by Paul Olivarri. A few of the beats are sample ridden while the rest are all original in composition. The two most notable samples come from the Ohio Players' "Fire" and The Crusaders' "Street Life." Lyrics are also on par with the rhythmical structure that is given to the artist. 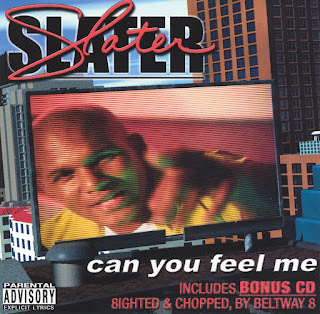 Slater's rhyme scheme might be typical but he does carry the ability to take the listener by surprise with his bold tone and a quick change of pace. He can also attack with a decent vocabulary as well. Subject matter is kept versatile and various styles are provided for the listener to keep them hooked. Guest appearances are made by D'nae Slater, Danielle Hamilton, Chris Benson, Ghetto and Big Turk. The album closes out with a total of thirteen tracks and also includes a bonus Eighted & Chopped disc done by the masterful, Mike Moore of the infamous Beltway 8 Records. Overall it's a dope record that gives off a satisfying vibe and has the power to play on both ends of the musical spectrum. A feat that is not easily attained but rather achieved by giving attention to the smallest of details. That alone places this album in the category known simply as, a diamond in the rough. Labels: 2003, Beltway 8 Records, Big Turk, D'nae, Ghetto, Key Jay, Mike Moore, Ohio Players, Paul Olivarri, Ricé, San Antonio, Sean Blaze, Slater, The Crusaders, Top Entertainment Inc.